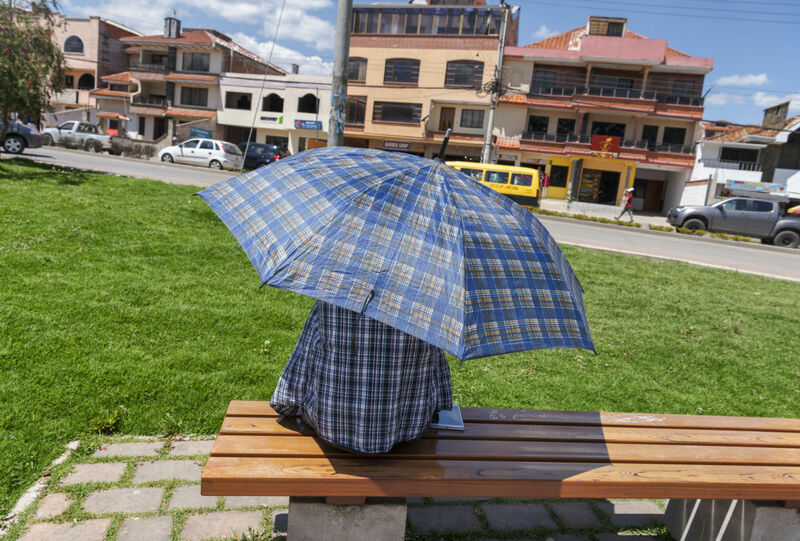 Michael Ernest Sweet: As I suspected, it is still possible to make a great umbrella photo. 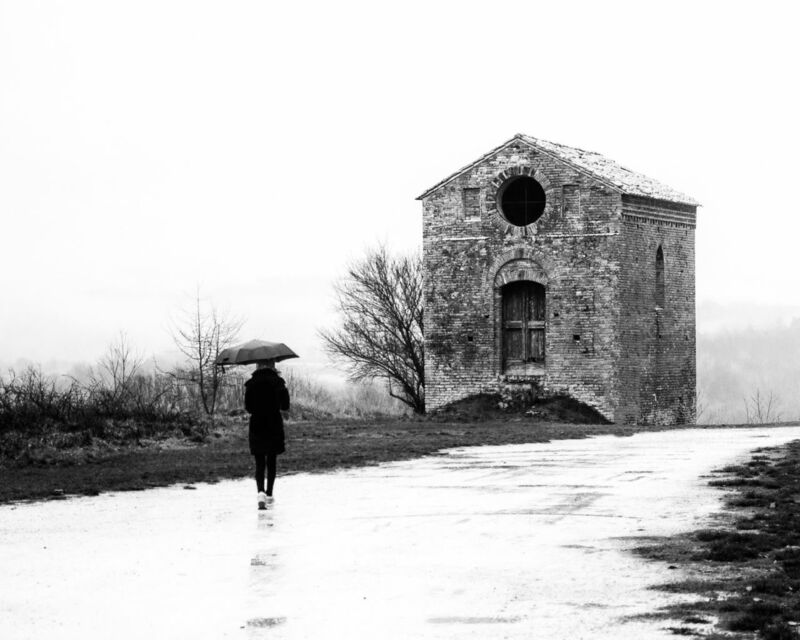 This despite the fact that we see so many photographs where the photographer was motivated by the presence of an umbrella. The distinction between a good umbrella photo and a poor one, seems to be centered on this motivation. 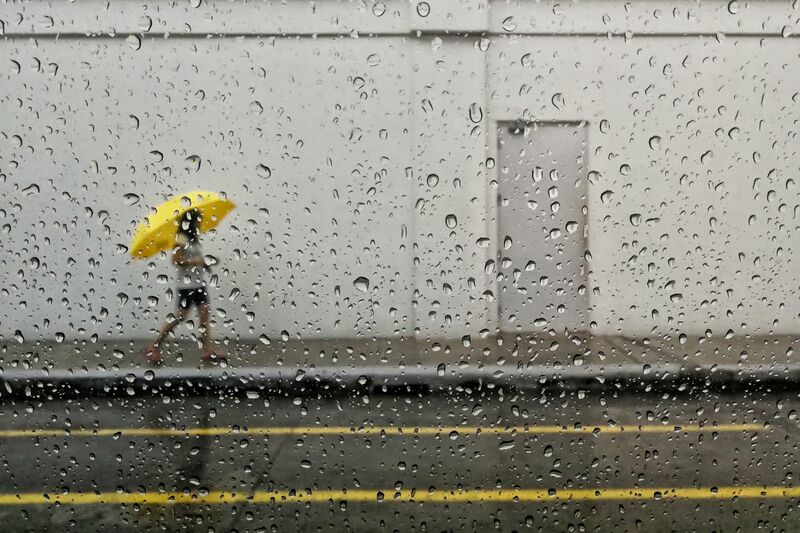 If a photographer trips their shutter simply because they see an umbrella - an act done often enough - it, generally, leads to an underwhelming photograph. 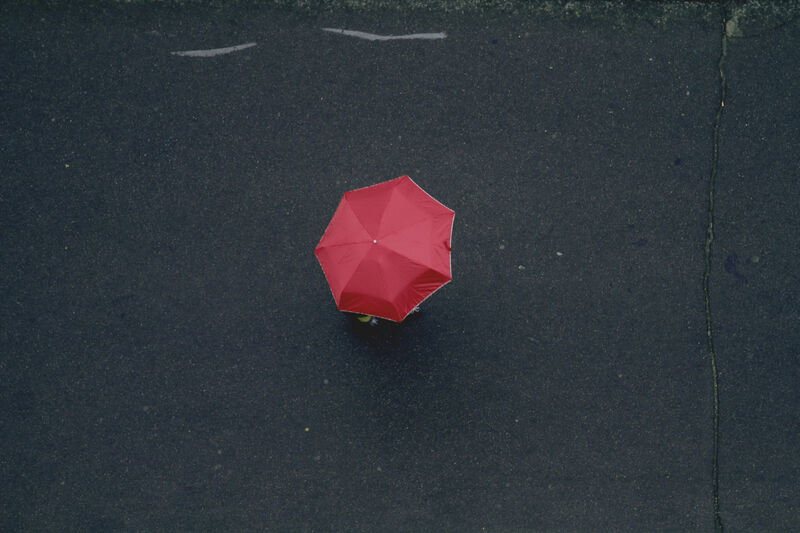 There is nothing inherently interesting about an umbrella. Perhaps that is the lesson. Yet, there can certainly be interesting, photo-worthy scenes which, by chance, happen to include an umbrella. 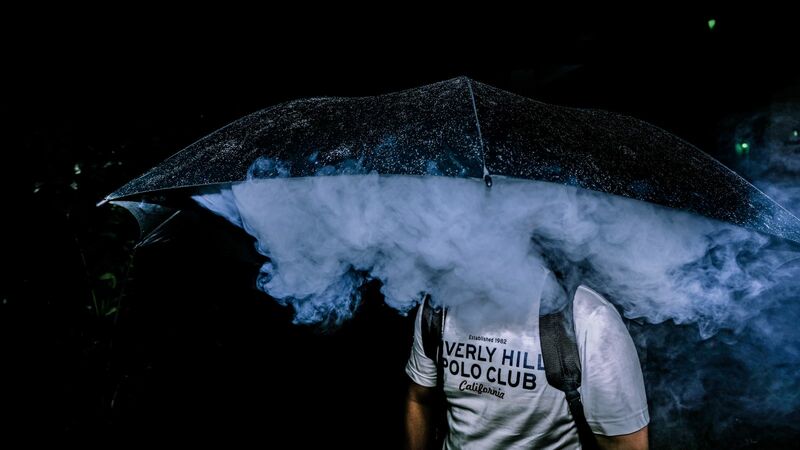 I launched this contest because everyone seems to have a trove of umbrella photos (they are perhaps the one photo I see most in judging) and I'm happy I did as I found some mighty fine umbrella photos. Enjoy! Michael Ernest Sweet: This winning shot is an interesting choice for me. I'm usually not a fan of these shadowy, underexposed photos (themselves a one-trick pony in the street photography world). Yet, here, it works. All the elements in this photo combine in a subtle but powerfully visual way. 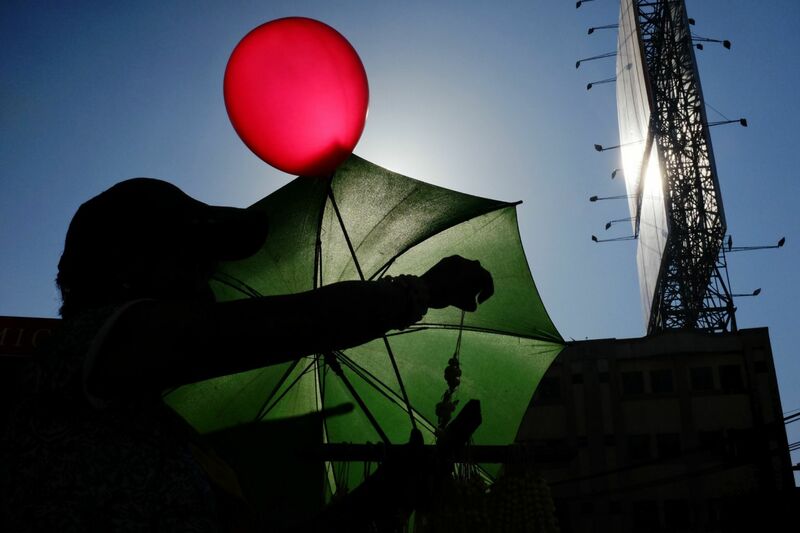 The vibrant red balloon, the lights poking off the sign - like little tentacles - the man handling something on a wire; all of this combines to make a wonderfully mysterious and tactile photograph. In the end, it may be just the central placement of that big red balloon that continues to draw me back into this photograph. Good job, photographer. Michael Ernest Sweet: I suspect this is a set up photograph, but I'm not opposed to such things on mere principle. Here, it works. I kept coming back to this image and thinking about it. How was it made? Why? How did they get that fog under the umbrella so neatly etc. Any photo that makes me question its composition so acutely must be a good photo on some level. In today's visually chocked world any photo that makes us stop and question is a definite feat. Michael Ernest Sweet: This photograph is almost an abstract painting. The two little squiggly lines along the top, the blotch of red in the middle, and a slight vertical line along the right hand side of the frame. These are the only visual elements. They are all abstract in some way, even if we can distinguish the red as an umbrella. This is a photograph that is perfect in its simplicity. At the same time all the elements are needed. For example, without those two little lines at the top, the photograph would be totally ineffective. Well seen. Michael Ernest Sweet: This photograph was well seen by the photographer. The contrasting (even clashing) plaid patterns create instant visual interest. The dutch angle adds energy to the image. The lines of the bench, grass, and the road combine to segment the image in a way that creates geometry. I'm always partial to people photos that manage to exclude all real signs of a human. For example, there is no flesh visible here at all. Is there really a man in there? A classic street photograph, this particular capture of an umbrella works for me in that the photo invited easy contemplation. Michael Ernest Sweet: I love the tones, lines, shades, and shapes in this image. The image works well as a color photograph and yet there is barely any color present - no easy feat. There is also an attractive stillness in this photograph. No people, no signs of life really at all. No distracting background. The image is simple and yet highly effective. It is an example of how successful photographs sometimes depend on very small details. For example, the lines in the rail mirrored by the water pipe. 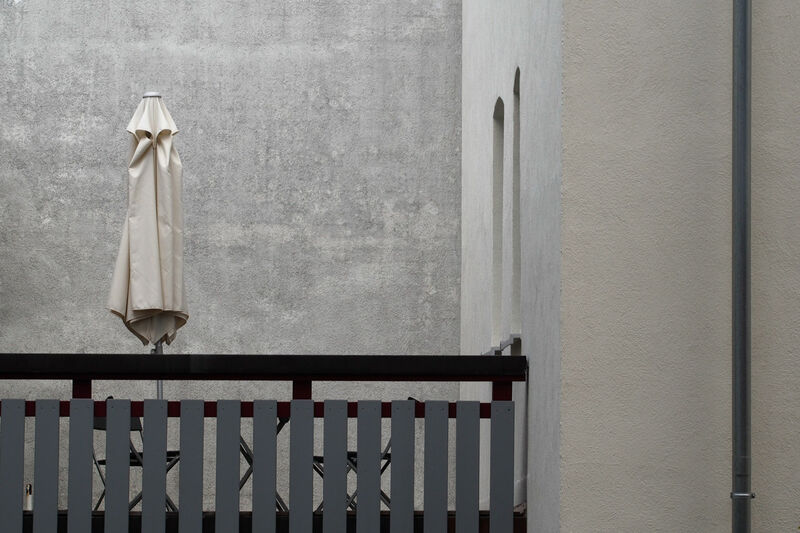 or the shapes in the top of the umbrella ever so slightly mirroring the shapes of the window openings in the wall. The metal parts of the chairs marrying with the metal clamp on the water pipe. All so subtle, but all so essential. 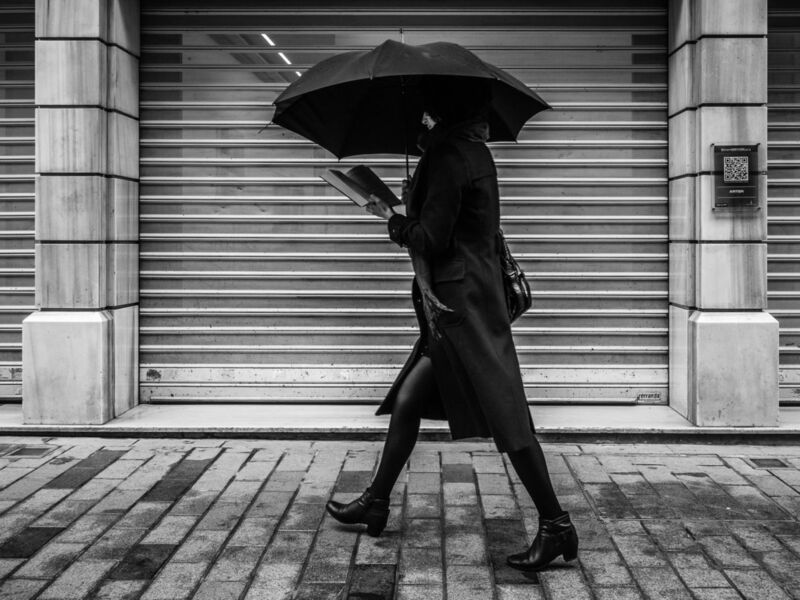 Michael Ernest Sweet: The high contrast, the black tones, the strong lines - it all combines here to make a basic but strong street photograph. The shape of the woman's body, the slight sliver of her face, and the open book are elements that made the image stand out for me. Michael Ernest Sweet: This is a very classic example of an umbrella photograph. Yet, it is done well. There is a calmness to the image that attracted me and made me return to the image again and again. Not all street photographs need be edgy, confrontational, or dramatic. Sometimes a rather ordinary photograph done well hits the spot, as was the case here. Michael Ernest Sweet is a Canadian writer and photographer. 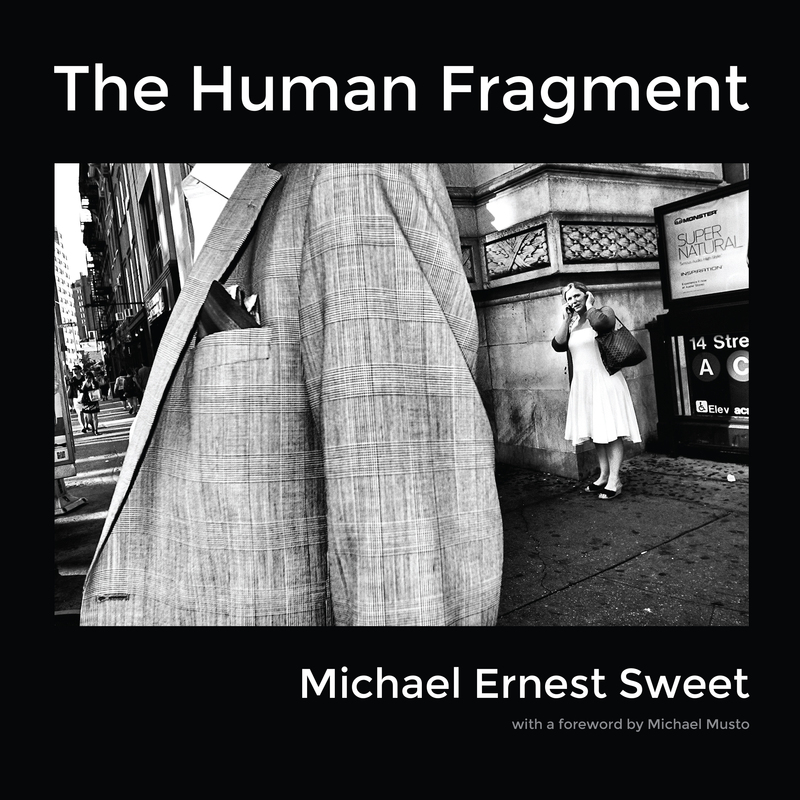 Michael is the author of two street photography books, "The Human Fragment" and "Michael Sweet's Coney Island" both from Brooklyn Arts Press. His instantly recognizable street photography is known for its gritty up-close depictions of humans in their natural habitat. Michael has been awarded two of Canada's highest civilian honours - The Prime Minister's Award and The Queen Elizabeth II Diamond Jubilee Medal - for significant contributions to education and the arts. Michael Sweet lives in New York City. 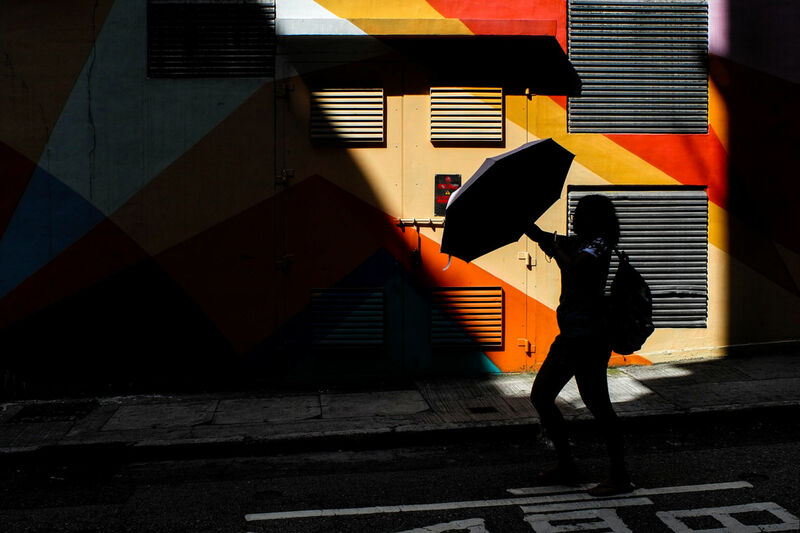 Another excellent World Street Photography competition, well done to everyone that entered.